Life is full of surprises, one of which happened last week when a box of healthy PC Blue Menu Products arrived at my house for my family and I to sample. I’ve been watching what I eat very carefully of late, in an effort to shed the extra few pounds winter always seems to add to my waistline, so these products came at the perfect time. The thing I like about products like these is that I can easily integrate them into the meals I prepare. I can use as many or as few as I like, and because I am one who enjoys cooking and like to mostly do my own thing, these products just add to that and help me to simplify and speed up my meal preparation. I was particularily impressed with four of the new products . 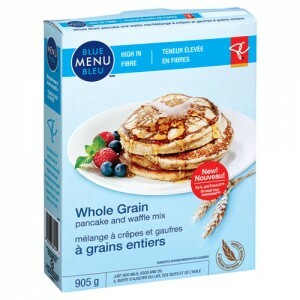 The Whole Grain Pancake and Waffle mix helped me make delightful pancakes (which we enjoyed last week on Shrove Tuesday) I am a big fan of the regular PC pancake mix, and I will readily admit that I will not likely switch to this one (opting in this instance for taste over nutrition) but the added nutritional value from the Whole Grain does make this product very appealing. My children happily gobbled them up, and I was quite pleased with how filling they were. One large pancake was, for me, more than enough! The Almond and Vanilla Granola completely won me over! I am a HUGE granola fan – I make my own various homemade versions often, and had stopped buying store-bought all together. This boxed one however, tasted like homemade and it had a lovely vanilla flavour. I was using it last week as a topping for yogurt and fresh fruit and it was equally delicious with milk! This photo is of a salad I made using the PC Quinoa. Quinoa is a delicious ancient grain, and if you’ve not tried it, here you go! 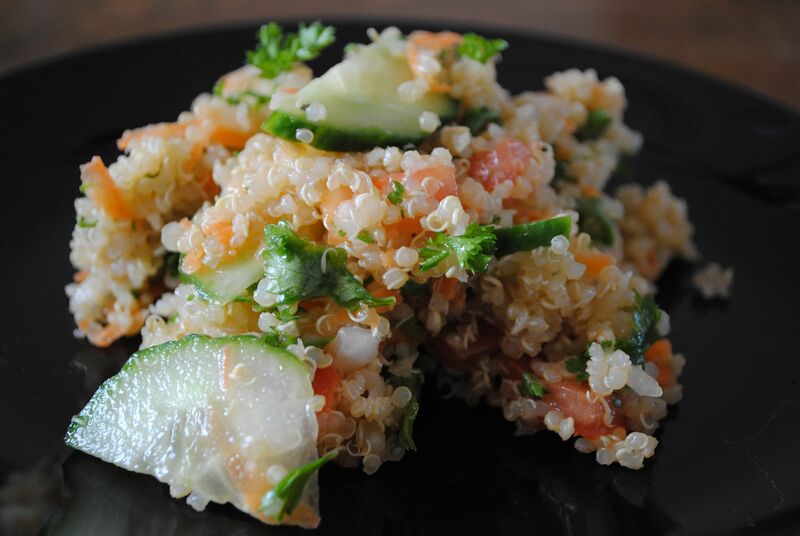 Right on the back of the box, is printed an easy quinoa salad recipe ready. The ingredients list is right there and you can grab everything you need at the store to whip it up once you’re home. I made a slightly altered version of it, and it was simple and delicious! The final product that impressed my fussy kids was the low sodium ketchup. My children think ketchup is a side dish instead of a condiment, and they were very happy with this in place of their regular brand. I was impressed that they were able to get a healthier version of something they adore. I love that PC has this ever-growing line of healthy products. They are sensible an affordable – what family wouldn’t like that? I am eagerly waiting to try the PC Greek Yogurt which I’ve heard so much about. I’m intrigued by it’s high protein content, and am excited about sneaking it into smoothies for my kids!! Shhh – don’t tell them! Tonight, we indulged in a Greek feast, and I only wished I had had some of the yogurt to make homemade tzatziki 🙂 Guess I’ll just have to make more Greek food again soon, and try it then instead!